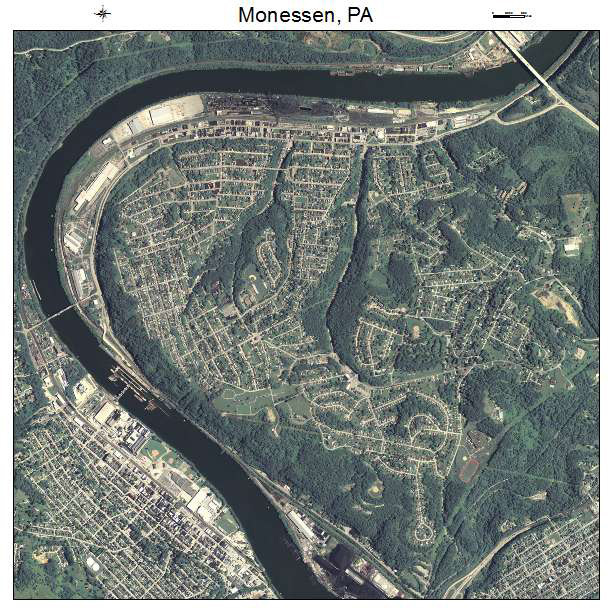 History of Monessen, Westmoreland County, Pa.
Of the towns and cities that were built the past forty years upon the banks of the Monongahela river, and there are many of them, the borough of Monessen is above all the most remarkable, both for its industrial activity and phenomenal growth, a real beehive of industry. Situated on the right bank of the river, its numerous manufactories line the shore for more than a mile. The residence part of the borough, which has now a population of ten thousand people, is built on three high ridges, with their intervening valleys. In 1897 the East Side Land Company of Pittsburgh laid out the plot on which this sprightly city stands. Surrounded by every natural advantage, coal in great abundance from the neighboring mines, natural gas and an inexhaustible supply of pure water capital flowed in at once. The principal streets are well paved with Belgian block and vitrified brick. There is a complete system of modern waterworks, gas, electric light and sewerage. The banking business is in the hands of three safely managed institutions, the oldest bank being the First National, opened February 17, 1900, with a $50,000 capital; S. M. Graham is its president. The People’s National Bank was established November 14. 1901, with $50,000 capital; J. Irons is its president. The Monessen Savings and Trust Company, incorporated November 1, 1901, with $125,000 capital, commenced business April 1, 1902; E. F. Eggers is president. The private banking house of Roeb, Roth & Company transacts a large business, including its foreign exchange department. The post office at Monessen does a large business, and handles more mail than many cities twice its size. The first postmaster was Colonel C. M. Derickson. The present incumbent is E. M. Frye. The office obtained free delivery service in July, 1904. The newspapers of the place are the following: The pioneer journal is the Monessen News (Republican), established by Charles E. Federman, 1899. He was succeeded in 1902 by C. L. Schuck. This paper is now a semi weekly. The Monessen Leader was founded in 1902 by John H. Thresher, and is now owned principally by the editor, H. R. Pore. The Daily Independent was established in 1903 by F. Householder. The religious element is strong in Monessen and is represented as follows: Christ’s Evangelical Lutheran Church was organized by Rev. C. J. Waltner, April 15, 1900. A good edifice was dedicated May 5, 1901. The Sumoi (Finnish) Evangelical Lutheran Church was dedicated June 15, 1902: The Christian Church, a frame building, was dedicated in 1902. A Greek Catholic Church. costing many thousand dollars, stands as a monument to this denomination. on the heights overlooking the beautiful valley. The Roman Catholic Church has a very large basement, built of stone and temporarily covered with iron roofing, in which the congregation worship. Plans are being made to build a fine superstructure the coming year. The Methodist Episcopal people built a church in 1900, and remodeled it in 1905. This is a substantial frame structure. An English-German Evangelical Lutheran Church was dedicated May 5, 1901. The Presbyterian Church was dedicated June 20, 1901. The United Brethren building was dedicated August 1901. The United Presbyterian people still worship in a private building over the News office. The other religious organizations are the African Methodist Episcopal, the Protestant Episcopal, the Baptist, and the Swedish Lutheran. Much attention is paid to the public schools of the place. Four attractive school buildings accommodate the pupils enrolled. Monessen is supported almost exclusively by the large pay roll coming as a result of her numerous and very extensive manufacturing plants. The Monessen Tin Plate Works of the Steel Corporation is one of the largest and most thoroughly equipped tin plate plants in the world. It was established in 1897 by putting in operation an eight mill establishment. The concern was soon absorbed by the American Tin Plate Company, one of the foremost constituent companies in America. It is now fully three times its original size, and has twenty five hot mills, forty five tin sets, and an annual capacity of 1,350,000 boxes of tin plate. In the plant 1,400 workmen find steady employment. Over 1,200 tons of sheet bars are required each week. The American Steel Hoop Company’s works cover an area of fourteen acres. It is a three mill plant in which 500 men are constantly employed. They handle about twenty tons of steel billets worked into skelp, hinge stock. barrel hoops and cotton ties, each working day. There are two continuous furnaces, and the fuel employed is natural gas. This factory never shuts down, but works day and night shifts, and was founded March, 1898. The Page Woven Wire Fence Company consists of open hearth furnaces, blooming, billet, rod and wire mills, fence weaving and machine shop departments. Seven hundred men are constantly employed. The daily capacity is twenty tons of rods and one hundred and fifty tons of high carbon wire, used for the making of the world famous electric weld “Page Woven Fence.” This brand of woven fencing is used by 700,000 farmers and stockmen, and foreign countries purchase large quantities of it. J. Wallace Page is the president of the company. The Monessen Foundry and Machine Company was established in 1900. They produce iron and brass castings weighing from one fourth of a pound to twenty tons each. The daily capacity is forty tons, and 125 men are employed regularly in these works. The Pittsburgh Steel Works is another extensive producing plant of the borough. At first the shops occupied twenty four acres in the center of a ninety six acre tract of land, but they are now very much more extensive. Several buildings are 200 by 1,200 feet, and the wire rod mills of this plant produce annually 125,000 tons of iron rods. The one hundred and seventy five wire nail machines have a capacity of 1,300,000 kegs of nails per year. In their wire fence department above there are in daily use fifteen electric welding machines and sixty barbing mills producing the celebrated “Pittsburg Perfect Barbed Wire.” It operates its own gas plant, giving both light and fuel to the entire works. Mr. George Nash is the general manager. The railroads passing through Monessen are the Pittsburgh & Lake Erie (steam) and the Pittsburgh Electric, both finely equipped steel highways. They have also the benefit of slack water navigation on the Monongahela river all the year except in the extremes of winter. It has twenty schools with 1087 pupils enrolled. *The Museum is closed on the Fourth of July, Thanksgiving, and the week of Christmas Eve through New Year's Day.